Get ready for the biggest campus motorshow in the metro as the UP Gears and Pinions proudly presents the 21st RevUP! 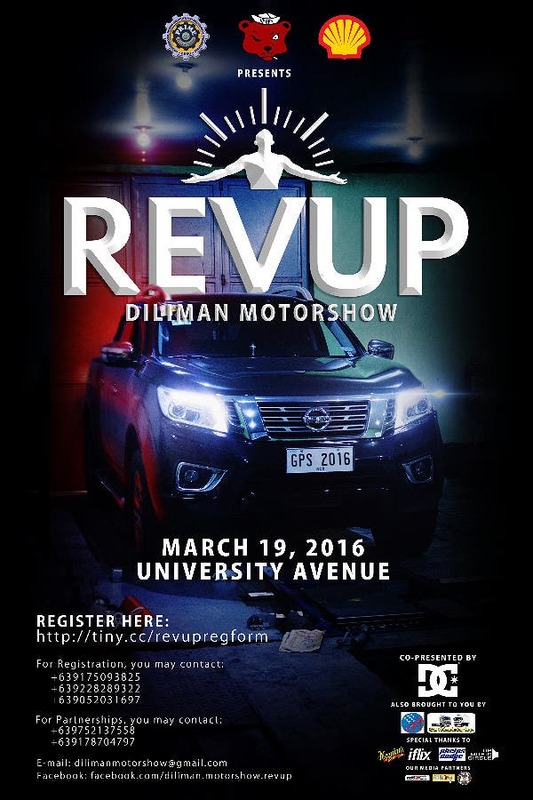 Diliman Motorshow on March 19, 2016, at the University Avenue, University of the Philippines – Diliman. This annual event gathers car enthusiasts from all over to witness a dazzling array of automobiles, ranging from timeless restored classics to customized cars. RevUP! will also be playing host to an RC Drift competition and a miniature car displays. As UP Diliman’s premier mechanical engineering student organization, the UP Gears and Pinions aims to pursue excellence in their field for the benefit of society. To further this advocacy, RevUP! Diliman Motorshow 2016 will be featuring “The Diliman Exhibit”, an on-ground exhibit that aims to educate visitors with new technologies in vehicle production, as well as to showcase the galing-ng-pinoy creativity and innovation in the field of automobiles. The RevUP! Diliman Motorshow is open to visitors throughout the day and will be culminating in an evening program. Fun activities and prizes await those who will partake in the event. For registrations, please fill-up our online registration form: http://tiny.cc/revupregform, for other inquiries, please visit: www.facebook.com/diliman.motorshow.revup . This event is in partnership with our media partners: WhenInManila.com, DZUP, and ClickTheCity.com.